Show Time at the Ministry of Lost Causes. Cheryl Dumesnil. Pitt Poetry Series. University of Pittsburgh Press. Pittsburgh, PA. 2016. Cheryl Dumesnil must have all the patience in the world at her fingertips to get to the clear water she shares with us in Show Time at the Ministry of Lost Causes. 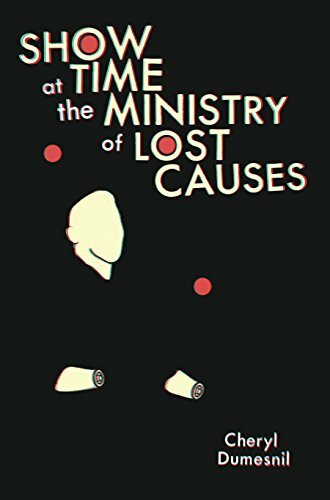 We are a big fan of good titles for books of poetry and Show Time at the Ministry of Lost Causes is an absolute classic. We knew it was going to be almost impossible not to like a book with this title and a juggler without hands on the cover. We were right. Dumesnil starts this collection with a quote from our old buddy Lao-Tzu and ends the book at "Lake Dharma" and along the way we see/hear Dumesnil fight the good fight (as John Hoppenthaler suggests), set that good example. These very human poems remind us all of what we require of love, what it takes out of us. need to remember about me. in the language of my mind. -- is what I dreamed. Today's book of poetry has been distracted this past week. A series of heavy snowfalls, the death of a family friend and a big old 750 page What About This - Collected Poems of Frank Stanford (Copper Canyon Press, 2015) have kept me from due diligence. I'd purchased the Stanford book several weeks ago and had gone through it lightly but hadn't had a chance to dig in. Well Frank Stanford is an astonishment and What About This reminded me of how exciting it was to discover a new poet I admire. Same thing with Dumesnil. From now until the end of time I will automatically pick up anything with her brilliant name on it. Why? Same reason as Stanford. Poems about the lives we live that are so full of wonder and new reason that you don't want to finish. Cheryl Dumesnil's Show Time at the Ministry of Lost Causes is just the excellent vehicle needed for Today's book of poetry to get back on track and everyone at this morning's read seemed to agree. Dumesnil's San Francisco birds enthralled Kathryn, our Jr. Editor, "Love Song for the Drag Queen at Little Orphan Andy's" did the trick for Milo, our head tech. while slam dancing with the custodian's assistant. crepe eels lolling in the fan breeze. cloaking all the cars, covering their tracks. Dumesnil is funny when she wants to be but Today's book of poetry was swayed by some deeper force at work. Dumesnil wants us to see through the veneer of our lives. Reading Show Time at the Ministry of Lost Causes was like having a freight train pull into the yard, car after car, solid as a rock, each one as dependable as the last and the next and each filled with its own necessary and perfectly delivered cargo. his aunt is losing her breasts to cancer. his threshold, this mom letting him go. Cheryl Dumesnil's ferociously smart poetry is exactly what Today's book of poetry needed on this cold, cold Monday. Survival songs for the new age. Oh yes, Cheryl Dumesnil is a lesbian and it is clear a lesbian is the narrator of some of these poems. Today's book of poetry is often confused about how big of an issue this is. To ignore the obvious might imply some sort of negative implication, and to point it out sometimes implies the same. Show Time at the Ministry of Lost Causes rattled my cage in the best poetry ways possible, Cheryl Dumesnil meets every criteria we have. Cheryl Dumesnil's books include the 2008 Agnes Lunch Starrett Poetry Prize winner, In Praise of Falling, the memoir Love Song for Baby X: How I Stayed (Almost) Sane on the Rocky Road to Parenthood, and the anthology Dorothy Parker's Elbow: Tattoos on Writers, Writers on Tattoos, co-edited with Kim Addonizio.